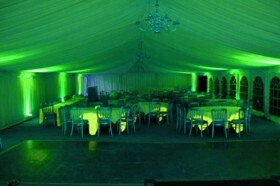 Stunning lighting schemes to 'paint your venue' with coloured light. We provide a venue lighting service, we can colour wash the walls of your venue with a coloured light of your choice using our discreet high quality LED uplighters. Safe & practical with no external heat, a valubale tool to help 'theme' your venue. Supplying extensively throughout the North of England, we will deliver and install a lighting plan that suites your requirements. 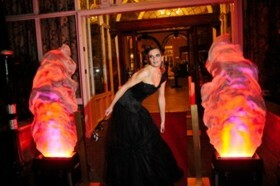 We are more than happy to meet you at your venue before your event to demonstrate our lighting to you and give you an opportunity to see the colours you would like on your day. This also gives the opportunity to draw out a plan of the room and design a lighting package exactly to your requirements and budget.